Frustrated that I'd never be able to remember these vignettes, I've been carrying a small spiral notebook to capture what I see and turn it into verse — specifically, Haiku. This ancient Japanese form compels me to keep it simple, to concentrate on "what" I want to say rather than "how" to say it. I enter the subway car, sit down, and it's nearly always the same. Glancing at my neighbors, I say to myself, "Nothing is happening. Everyone is in their own world. What can I possibly write about?" But I've committed myself to craft an original Haiku, and I have to do it before the doors open at my destination. So I look intently. I focus on the smallest details. And then, almost inevitably, I see something worth remembering. I start to count on my fingers. Line one… five syllables. Line two… seven. Line three… five. Slowly at first, then faster and faster, a poem comes together. Writing Haiku on the subway (I call it "Subku") is a personal challenge — certainly not for everyone — but this exercise has convinced me that keen observation is a skill we all can and should get better at. What? Another New Year's resolution? Isn't it enough that I'm finally going to the gym and keeping my email inbox uncluttered? Sure. But if you want to find hidden problems in your business, discover something new, or know where opportunities are you have to get your head out of your phone and look around. 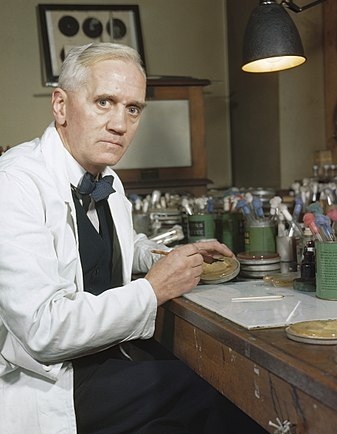 Alexander Fleming's discovery of the first antibiotic, Penicillin, in 1928, is rightfully regarded as a triumph of serendipity. His petri dishes of cultured bacteria, hastily stacked on a workbench while he went away on vacation, became contaminated with a bacteria-killing mold. That stroke of luck, combined with the wisdom to notice things not sought after, earned him a Nobel Prize and a place in medical history. What's less well known is that Fleming's earlier discoveries, such as the antibacterial enzyme lysozyme, came about from a similarly keen perception. So it wasn't just good fortune. Fleming, and people like him, are always observing and primed for discovery. The key is to make it a habit, to have a "practice" of active and careful looking. That's what the Toyota Production System (called Lean Manufacturing in America and Europe) builds into its process. One of the core practices of the Toyota Production System is a routine that requires every executive to regularly walk the factory floor, closely observing manufacturing operations and engaging with those responsible for front-line work. Gemba Walks (meaning "going to the place where work happens") integrate active looking and curious inquiry into the day-to-day responsibilities of everyone in a company. No manager or executive is exempted from this practice, which means that serendipity — finding something of value not sought for — has the greatest chance of happening. With the rise of Artificial Intelligence the need to understand how to observe with precision and context is more important than ever. Computerized deep learning systems still struggle to find and identify objects in a visual space. As a recent article in Quanta Magazine explains, AI programs often founder when confronted with objects that don't quite belong. "Researchers introduced an anomalous object into the scene — an image of an elephant. The elephant's mere presence caused the system to forget itself: Suddenly it started calling a chair a couch and the elephant a chair, while turning completely blind to other objects it had previously seen." Human beings can do something that AI systems currently cannot — notice when an object doesn't fit or when a scene is unusual in an interesting way, and go back for another look. So either we need to find a way to program that kind of observational curiosity into AI or cultivate it ourselves. Whether it's looking deeply at the world around you and writing haiku, or sketching people in an airport lounge, or giving yourself the license to look, think, and then look again, I encourage you to put "serendipity" on your New Years resolution list. Discovery awaits you.